MELBOURNE, Australia — Svetlana Kuznetsova has a different look than most tennis players. And it's not just all the tattoos. 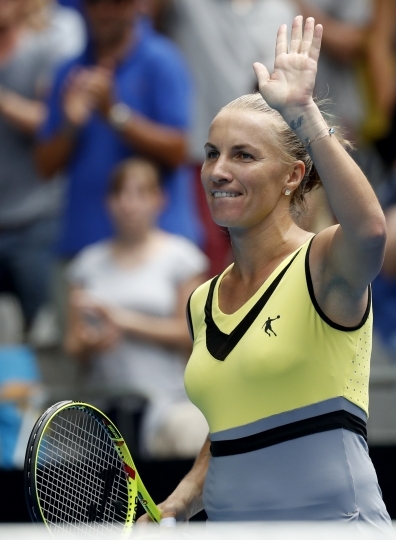 In a tennis world dominated by the bright colors of Nike and Adidas, as well as new fashion entrants like Uniqlo, Kuznetsova has taken a risk with her clothing sponsor — a Chinese company called Qiaodan which has been at the center of a high-profile trademark dispute. As Chinese sportswear companies seek to grow their brands in a crowded domestic marketplace, they've spent years chasing big-name foreign athletes with lucrative sponsorship deals, namely basketball players. Li Ning started the trend by signing Shaquille O'Neal in 2006 and now has Dwyane Wade of the Chicago Bulls on its roster. The Chinese sportswear brand Anta, meanwhile, has signed Klay Thompson of the Golden State Warriors, and Peak sponsors Dwight Howard of the Atlanta Hawks. But in tennis, Chinese companies have made fewer inroads, especially among top players. One exception is Kuznetsova's deal with Qiaodan, which began in 2013 when the Russian player's agent received an offer from an unfamiliar brand. "I said, 'What's the company'? 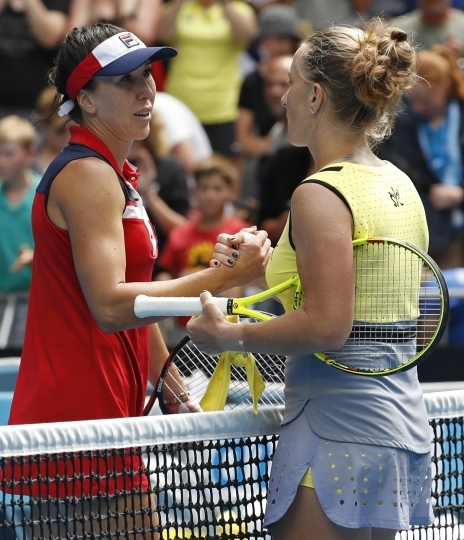 And he didn't remember the name," Kuznetsova said after her third-round win over Jelena Jankovic at the Australian Open on Friday. "I said, 'OK, let them send me some samples to see.' I cannot sign with somebody who I have no idea, to see what quality, because I want to look good." When the samples arrived, she was impressed the company had made her a special logo — her initials with a butterfly. The two-time Grand Slam titlist was coming off an injury-plagued year and her ranking had dipped outside the top 70. And the butterfly was meant to symbolize a rebirth — Qiaodan's belief that she'd revive her career. "I thought it's really special and they will ... treat me special," she said. Kuznetsova may not at the time have heard of Qiaodan, but the company was well known to a certain basketball legend — Michael Jordan. In 2012, Jordan filed suit against Qiaodan over a trademark dispute, claiming the company had profited from using the Mandarin transliteration of his name. Jordan has been known by the Chinese characters for "Qiaodan" since he gained popularity in the mid-1980s. In a surprise verdict, China's highest court partially sided with Jordan last month, saying he owns the rights to the Chinese characters for Qiaodan. The company, however, was permitted to use the Romanized spelling of the name. In a statement after the ruling, the company defended its actions but said it would respect the court's decision. One perk of the partnership, Kuznetsova said, is she can collaborate with Qiaodan's designers on the outfits she wears on court. "She will tell us she wants some kind of design and also the colors and materials," Vivienne Wang, a sports marketing sponsorship supervisor at the company, said by telephone from China. "We'll also have some special designs — T-shirts for her fans, coaches and family." Some designs are more successful than others, such as the one she's wearing at the Australian Open, a gray and yellow outfit with rows of small holes cut in the skirt. But to Kuznetsova, what's important is she looks like none of the other players. "I love the collection for this year," she said.